The first cocktail in the line-up is the sparkling vesper, the martini’s flirty, bubbly cousin. The light, citrus element of the lemon melds with the mellowed gin (thanks to a healthy accompaniment of vodka) to create a lighter answer to a gin cocktail that keeps the rich herby and woody elements that makes gin lovers swoon without overwhelming those who tend to go for a less overwhelming base. 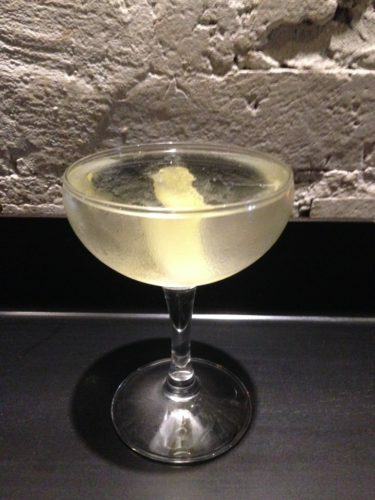 Served in an old fashioned champagne glass and with a light fizziness from the carbonation specifically chosen to add an effervescent quality, this cocktail is a Roaring Twenties throwback that fits surprisingly well with the industrial architecture and soft, mellow lighting of the bar. 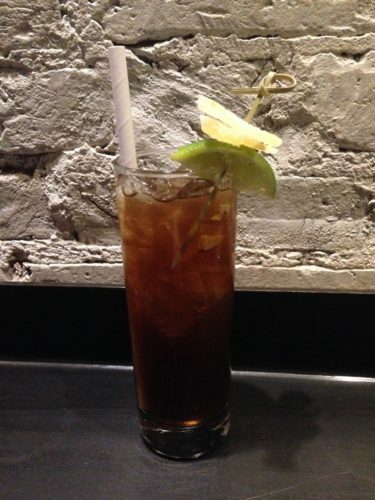 The Black ‘n Stormy is an odd fusion of a rum-based drink and a Moscow mule. Though it seems none of these ingredients should work together, in reality they meld into a warm, spicy, and unexpected blend that had even this rum-hater prepared to convert. The secret is the ginger beer, which picks up on and melds with the spiciness of rum to create a warm complex background for the lime to cool subtly. Served in a highball glass with a skewered slice of lime and candied ginger, even the presentation has a spicy, tropical flair. Blewett, when asked to comment on the ideas behind the drink, talked about emphasizing contrast. The drink starts with a strong, dark rum that has already been paired down and is paired with the brighter, lighter elements of ginger beer and lime to provide a study in opposites. The jarring wrong note in an otherwise incredible lineup was the Continental Sour. Though the idea was to go back to the roots of the New York sour with a rich Bordeaux-style red wine float, I would argue there is a reason this element went out of favor. 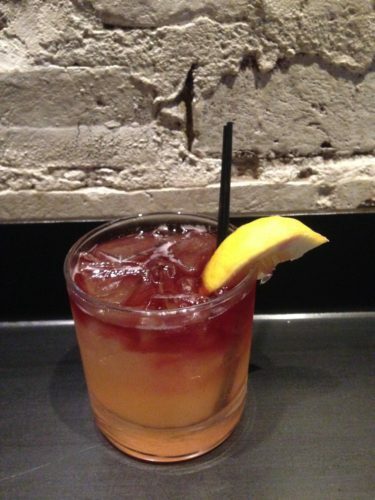 The red wine and the simple syrup, lemon, and rye became discordant notes trying to overlay each other, with neither being improved by the combination. Instead, the wine’s tannic notes were emphasized and the warm elements of the rye and brightness of the lemon were overpowered by the strong red wine. Though the attempt to avoid the often overdone sangria is to be applauded, this drink is one that seems to require a return to the drawing board. 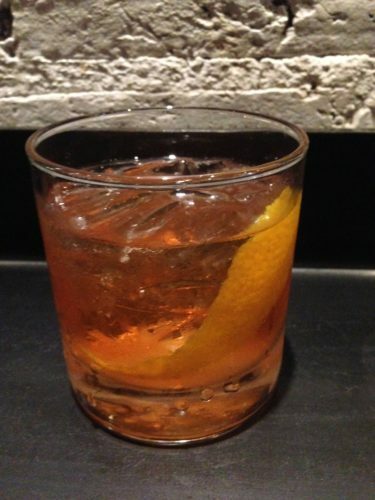 The final member of the lineup is the Oaxaca Old Fashioned, an interesting take on an old fashioned, with tequila used in place of the more traditional whiskey or brandy. With the nice compliment of an orange garnish, this drink takes advantage of the classic combination of tequila and orange and does so beautifully. The classic combination in an old school drink creates a standby for those who prefer a solid, performer that is stalwart rather than flashy. The choice of a tequila base is an interesting twist that prevents the drink from becoming a stale repetition and instead allows it to emphasize a combination that is a classic for a reason. As a compliment to the boozy infusions that brought me to Tria, I also had the opportunity to try their fries, a smashed fingerling dish with a “truffle-Taleggio fondue”. To me, how well fries are done can make or break a bar, as the perfect crisp, salty, umami fry can be a wonderful compliment to any number of alcoholic beverages. In this, Tria Taproom did not disappoint. The fries were warm through with a crispy outside and a smooth interior that perfectly picked up on the creamy truffle cheese sauce they were doused in. The portion was generous and contained enough sauce that no fries were left bare at the end. Further, they served their ultimate purpose as bar food and provided a salty, greasy canvas to help balance out the impressively strong cocktails. Despite the wrong note of the Continental Sour, this first batch of on tap cocktails by a place better known for its beer and wine menu is an impressive foray into the world of cocktails, and I would be very much surprised if they do not become a feature of the Tria Taproom in the coming months.